You know how I was born on the other side of the pond and was completely clueless about apple pies? Yeah. Didn’t have a clue. Then I saw one and thought, oh, it’s a round apple strudel! And then I bit into one and realized that it wasn’t… Close, but not quite. So. It’s been a long while since we discussed pie around here, ha? I think of pie making as a winter-business thingamajig and that is why I haven’t had one since those Boozy Fruit Tartlets. Good thing we’re changing that today! World, universe, please meet the easiest apple pie, ever – this is Inside-Out Apple Pie A La Mode. A huge scoop of vanilla ice cream nestled comfortably in a cinnamon-sugar tortilla, and topped with a homemade apple pie filling. …And I just drooled… Please, excuse me. I have gone on and on about how ice cream is my favorite dessert of all time, thus this little, individual treat should come as no surprise. When thinking about 4th of July, and looking for food inspiration, apple pie is my go-to. Always. What’s more American than Apple Pie? Nothing, right?! Considering this holiday is in the middle of summer, I can’t even be bothered to think about rolling out pie doughs and baking for days on end. The only baking we’re going to do around here is for these delicious cinnamon-sugar shells. Don’t worry, they are ready in 15 minutes, from start to finish. While those bake, you’re going to chop up some apples, toss them around with a bit more cinnamon and sugar, and fry ’em! YUM! Seriously, these are wildly delicious. I don’t know how you are going to stop yourself from having two, or three, or four, but good luck to ya. I wasn’t so lucky. I could’ve had all of them. Good thing I only made six. Scoop of vanilla ice cream nestled comfortably in a cinnamon-sugar tortilla, and topped with a homemade apple pie filling. Grease a 6-cup muffin tin with cooking spray and set aside. Using a round, 4-inch cookie cutter, make the tortilla cut outs. Carefully fit tortilla cut outs in prepared muffin tin. In the meantime, prepare the apples. Pour the remaining of the butter in a frying pan and place over medium-high heat. In a medium-sized bowl combine the diced apples with the remaining cinnamon-sugar (use less if you don't like too much spice), and mix in the nutmeg. Add the apple mixture to the frying pan and cook for about 10 minutes, or until tender, stirring frequently. Remove tortilla shells from the oven and cool completely. Add a scoop of vanilla ice cream to each tortilla shell. Top with warm apple pie mixture. 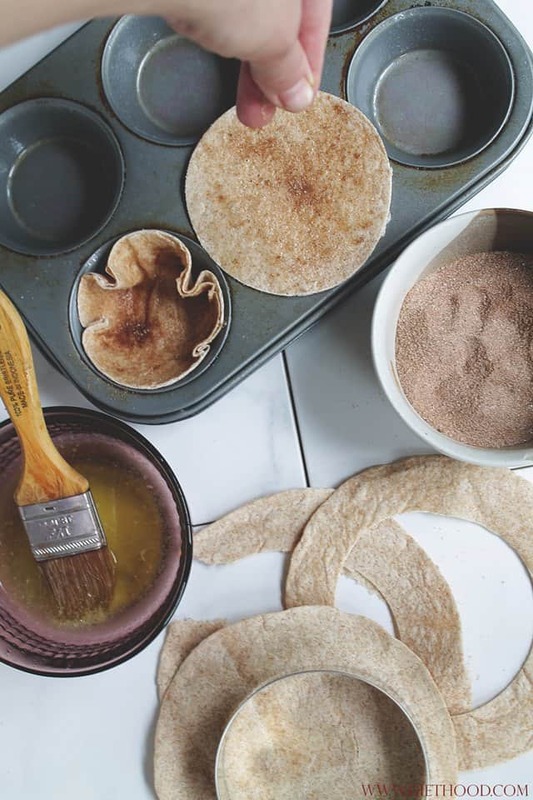 How far in advance can you make the tortilla cups? As long as they are not filled, they should be good if made even 2 days ahead. Fill the cups right before serving. I love your photography. The angle of the spoon in the overhead shot–just gorgeous. And the recipe looks tasty, too! These are so creative! I still have some tiny tortillas left and they’d be perfect for this recipe–love apple pie! These are stunning! I feel like I can taste them through my screen! You’re so kind, Jen! Thank you!! OMG! I was hooked on apple pie with ice cream when I was preggers with Miss A. I would have eaten at least one of these a night. Probably still could! 🙂 Delicious!!! 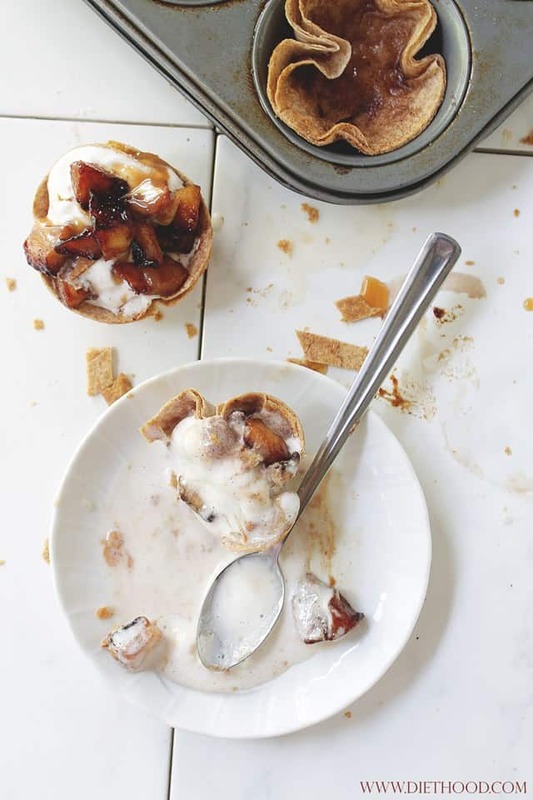 Love the idea of simplifying apple pie like this! Beautiful and the little tortilla crust…so smart. What a great idea! 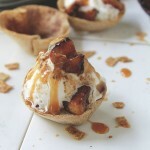 And those cinnamon sugar shells look delish and super easy. As a woman who also hates to make pie dough, you get a big thumbs up from me. These are the cutest pies ever! Gorgeous photos! Seriously this has to be the best recipe I have seen today! The way you did the crust…genius!! Awww, Nancy, that means a lot!! Thank You! 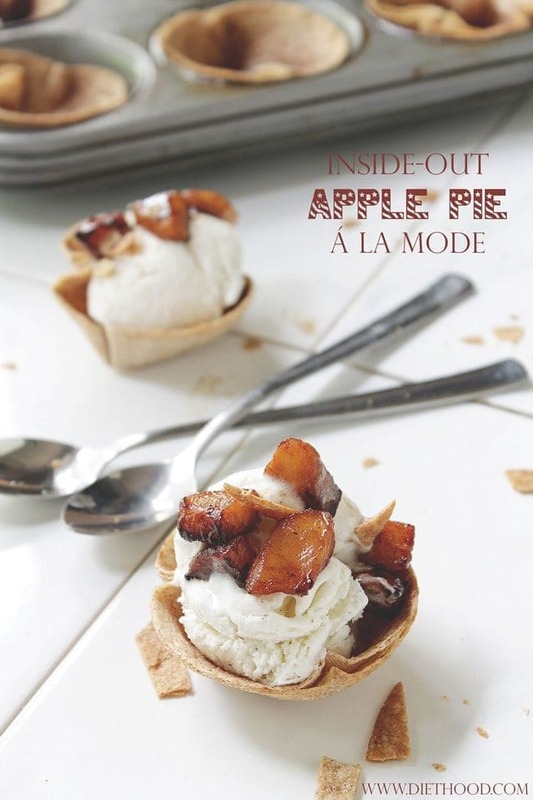 These apple pie a la modes look great! I agree with an earlier comment about using the tortillas – way to go. I know, right?! Apple pie and ice cream is such a great combo! Best use EVER!!!! of a whole wheat tortilla! Stunning little pies and sooooo creative! Thanks, Averie!! 🙂 They are soooo good! These individual apple pies look delicious!